If you like Chateauneuf du Pape then my local Tesco (Redditch) has them at £8.00 a bottle. If you can manage half a dozen then they're only £6.00 with the 25% off. I'm not sure how long this offer is on for. It is good wine - have tried it. I don't profess to be an expert but having tried the wine from the region on many occasions and paid up to £19 a bottle for it I suggest that at £6 it is worth a punt. Which particular label is this please? 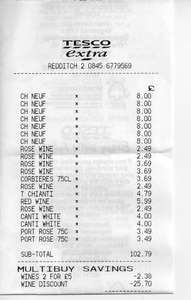 There is no £8/bottle CNdP on Tesco.com, so I might take a trip to my local Tesco and avail myself of the price checker there if necessary. I have yet to try a CNdP that is not good and at £6 a bottle this has to be a jolly decent deal - if available. It isn't labelled as a 'Tesco' wine the info on the label reads: … It isn't labelled as a 'Tesco' wine the info on the label reads: -Promenade - Botttled by Les Celliers de Beauregard, 69800 - 13%Vol - 2010I don't profess to be an expert but having tried the wine from the region on many occasions and paid up to £19 a bottle for it I suggest that at £6 it is worth a punt. Sorry, you beat me to it. Thank you for the more detailed info. That should help. Which particular label is this please?There is no £8/bottle CNdP on … Which particular label is this please?There is no £8/bottle CNdP on Tesco.com, so I might take a trip to my local Tesco and avail myself of the price checker there if necessary.I have yet to try a CNdP that is not good and at £6 a bottle this has to be a jolly decent deal - if available. Promenade (probably the most useful detail to identify the wine) - Botttled by Les Celliers de Beauregard, 69800 - 13%Vol - 2010 and the bottle is embossed "Appelation Controlée CHateauneuf do Pape"
I hope you find it,. Well they had the 2010 Promenade by Celliers de Beauregard in my local Tesco, BUT that was a Cotes du Rhone, not a CNdP. Shelf edge label said 9.99, but I didn't bother to double-check the price. oO Hurry.....the 25% off 6 bottles of wine offer ends tonight @ midnight..good luck! Updated.It is good wine - have tried it. I'll bet you have. Judging by some of your comments on here. Well i've just got 6 of them @ £4.00 each and got an extra £1.60 off for some reason-and it is delicious-just as good as a 20 quid bottle of Chateauneuf! Yum yum yum all the way to the bank! Deal posting newbie! This is Hodgey first deal post. Help out by leaving a posting tip or just to show your appreciation for their contribution.